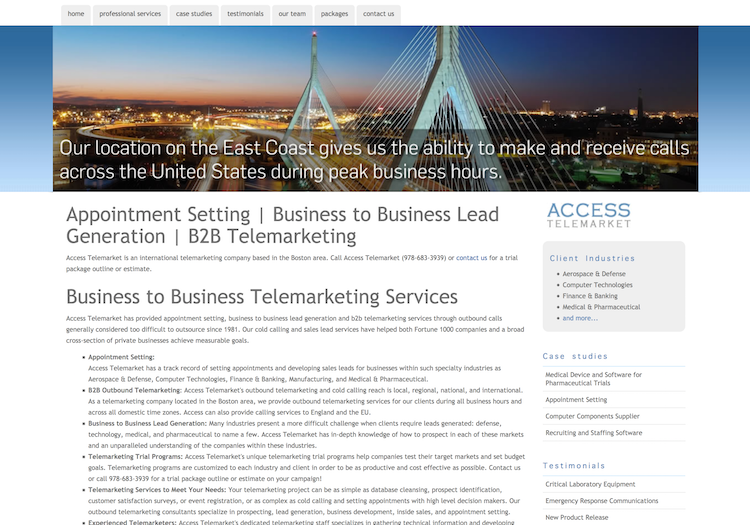 Access Telemarket hired us to redesign their existing web site. The project goals were to project a professional image, organize the web site content, make the site SEO friendly, and add a content management system (CMS) so the client can add and edit content when needed. We researched appropriate keyword phrases for Access Telemarket and worked with them to refine their content to improve their ranking in search engine results. We built a custom web application that allows Access employees to update their own website content. The CMS powers all of the content pages, including the case studies and client testimonials sections. We created several text and image ads for a pay-per-click online ad campaign. Access Telemarket has reported to us that they are getting more calls from the campaign, and are getting better quality leads.